As part of a blog tour organized by Great Escapes Virtual Book Tours, I am pleased to have Susan Santangelo as my guest. She is here today to share her thoughts on mystery writing and tell us about Sleuthing Women, a boxed set of 10 mysteries that includes one of her books, Retirement Can Be Murder. I love mysteries. Susan, what made you decide to write mysteries? I’ve loved reading mysteries ever since I was a little girl. And I’ve been lucky enough to eke out a “meager” living as a writer for newspapers and magazines ever since the 1970s. When my husband of umpteen years announced that he was retiring from his 9-5 office job (he’s a writer, too), I suddenly realized that I needed to figure out something for us to do together, so we didn’t drive each other crazy. I’d been toying with writing a mystery about Baby Boomers. So many potential readers! I proposed that we write one together. But it didn’t work out that way. Tell me a little bit more about Retirement Can Be Murder. Well, let’s just say that we’ve never found a dead body. As far as the rest of the story goes, I write what I’m living every day. The first book turned out to be the beginning of the Baby Boomer mystery series when readers wanted to know what happens to Carol and Jim after he retired. Book 2 is Moving Can Be Murder about the couple’s decision to sell the family home and downsize. Book 3, Marriage Can Be Murder, involves the destination wedding of one of the couple’s children. Class Reunions Can Be Murder takes place at Carol’s 40th high school reunion, and in Funerals Can Be Murder, a hunky handyman who works for Carol and Jim dies under mysterious circumstances. In Second Honeymoons Can Be Murder, the couple travel to Florida for a very unusual anniversary celebration. Carol celebrated just a little too much while she was in Florida and gained some excess pounds, so I decided she needed to start counting her calories. I’m writing Dieting Can Be Murder now, and learning a lot about healthy food choices. And, I love this title, since I realized that the first three letters of the word “dieting” are “die.” What a natural title for a mystery! I’m a terrible eavesdropper. And I love to shop. When I’m having trouble with some dialogue or a particular scene in my w.i.p., I order myself to take a break for some retail therapy. I always choose the longest line at the supermarket, too. It’s amazing what people talk about on their phones in a public place these days. I get lots of ideas. But, alas, our accountant says we can’t call my credit card purchases “research” and deduct them. I am guessing you read a lot of mysteries. Do you enjoy reading (or even writing) other genres as well? What are you currently reading? I’m lucky enough to get to review mysteries for Suspense magazine. Right now, I’m reading And Then There Were Nuns by Kylie Logan. It makes me laugh out loud, especially since I went to Catholic school. I’d like to go back to Italy. I love the people. And I love the food! What advice do you have for other Baby Boomers? It’s never too late in life to try something new. If you can dream it, do it! If not now, when? As part of this blog tour, enter for a chance to win one of five e-copies of the Sleuthing Women boxed set in a Rafflecopter giveaway. Susan Santangelo pens the bestselling Baby Boomer mysteries, a series of humorous cozies which follow the adventures of a typical boomer couple as they navigate their way along life’s rocky highway toward their twilight years. 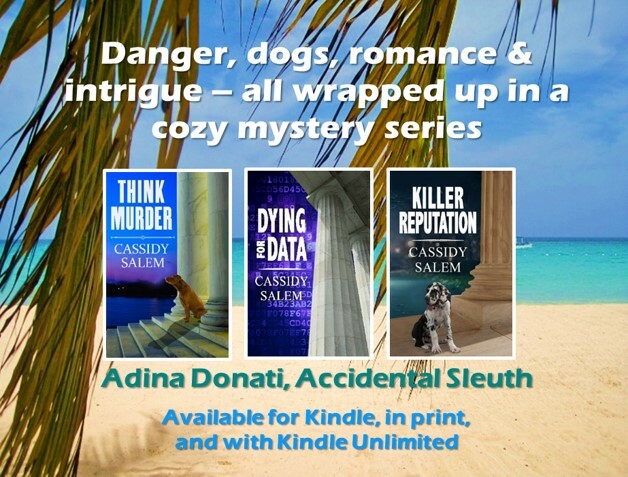 She is a member of Sisters in Crime, International Thriller Writers, and the Cape Cod Writers Center, and also reviews mysteries for Suspense magazine. She shares her life with her husband Joe and two very spoiled English cocker spaniels, Boomer and Lilly. Boomer also serves as the model for the books’ covers. < Previous Spotlight, Guest Post & Giveaway: WITHOUT A DOUBT by Nancy Cole Silverman and a Review, too. Great interview-I hope I win the boxed set…. Susan, with a recently retired husband myself, I can say they are a mixed blessing. But fortunately, he has his music, so he leaves me alone enough to get my writing done. Loved your blog! Having my recently retired husband around all day was a challenge for me too 😄 i sooo get it. Lucky you! Separate interests are so important. My husband and I are both writers, so…. Nice interview. Nice box set. It’s a wonderful box set, and I’m so lucky to be part of it. Thanks for this, Susan. SO many of us can relate to this! My husband is a techie, so all I have to do is create a problem and he’ll be distracted until lunch time! Aren’t you the clever one!! What a great idea. Hmm. Wonder what I can come up with for my own husband. Another point of connection, Susan–my protagonist is also a Carol. What made you choose the name? I picked the name Carol becauseI knew so many Carols when I was growing up. I try to use character names that were common in the Boomer era. Can’t use one of the most common ones, though. There were 8 Susans in my own high school class! I love the way your series flows quite naturally from one real-life scenario to another. I’m looking forward to reading your book in the anthology! Maggie, that is such a compliment coming from an author I admire so much. Backacha!